College girls everywhere are gearing up for the 4th of July--a day usually spent having fun in the sun, grilling with family and friends and ending the night with your eyes set to the sky watching fireworks. So why not celebrate our country in style with these ode-to-America staples? Since the invention of denim overalls by Levi Strauss, Americans can’t seem to get enough of their jeans. 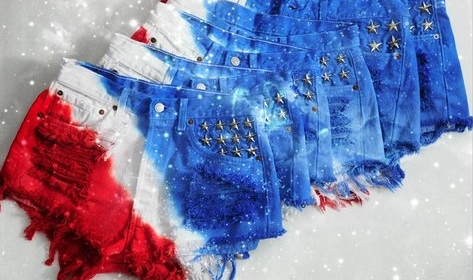 Individualize one of America’s classic garments by distressing your own pair of jean shorts. Visit your local hobby stores for stud kits, and use a key for ripping. Then throw them in the washing machine to enhance the fringe. If you’re not into DIY, head to stores such as Urban Outfitters or Forever 21 to purchase a pair of this summer’s most popular item. Use denim to knock out the blue in the red, white and blue equation; wear your red by choosing a striped, see-through chiffon blouse, like this one from Modcloth. You can wear a white bandeau, or if you’re headed to the pool, wear your bikini top underneath. Next add a pair of another one of America’s classics—all-white Chuck Taylors. Complete your look with star accessories and a pair of aviator sunglasses—your way to thank the great airmen of the U.S.